This research investigates the process of change in moving from a domestic accounting standard, AASB 1037, relating to self-generating and regenerating assets (SGARAs) to an international standard, AASB 141. It focuses on the achievement (or nonachievement as it may be) of sustainable reporting practices for these agricultural assets. This paper finds that the transition to AASB 141 has allowed firms the discretion to change how they value their agricultural assets in comparison to the domestic standard. Consistency may have been achieved to a limited extent with the introduction of this financial accounting standard but comparability appears not to have been. Further, there is very limited understanding of the reporting of these assets from a user's perspective. 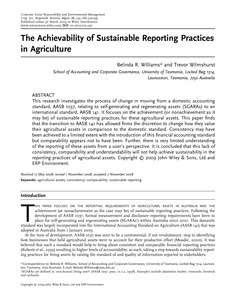 It is concluded that this lack of consistency, comparability and understandability will not help achieve sustainability in the reporting practices of agricultural assets.